Home » parenting » Why Are We Afraid to Let Kids Fail? When Smarty turned 10, she informed us that she would like to drop gymnastics and switch to martial arts instead. While she enjoyed certain types of exercises in her gymnastics class, such as beam, she never warmed up to the bars considering them to be too risky. We were also considering a switch, so her request came at a good time. Our close friends recommended a taekwondo studio where their young son was already taking classes, and we agreed to give it a try. Smarty took to taekwondo surprisingly well. She responded readily to martial arts rituals, she liked to yell during classes, and she did her best to impress her coaches - easily learning the moves and trying to do them to the best of her ability. I was skeptical that she would want to break boards - after all, it can be painful if done incorrectly, but Smarty rose to expectations of the coaches and mastered all the basic board breaks. Every two months students who attended classes regularly were eligible for belt promotion testing. In lower levels, white to yellow belts, it was enough to show up to the promotion testing and demonstrate your skill. In higher levels, students were required to earn a certain number of points out of 10. A belt promotion testing included a board break - on Smarty's belt levels a student was given 3 attempts to break one board with any of mastered kicks or punches. On higher belt levels, a student needed to do two board breaks (3 attempts each). Basically, ability to break a board would indicate whether the student is able to move up. If the student was unable to break a board, his/her score would fall below the required cutoff line, and this student would be given two attempts to retest or stay on the current belt level. Smarty was taking belt testing very seriously. She would attend special prep classes practicing her board breaks to the point that I would be worried about her overdoing it, she practiced her form at home, and she was always striving to get the maximum 10 out of 10 on her tests. There was one time when she was sick during the week leading to belt testing and did not break her board during the test. She was upset, but this prompted her to really dial it up during the week leading to retest. She showed up for her retest, broke the board on the first try, and earned her belt fair and square. Well, apparently this way of testing taekwondo students was too intense and not conducive to the money-making machine of taekwondo franchises. Victory Martial Arts (that's an umbrella organization that Smarty's studio belongs to) made a decision in January to replace belt testing with "belt graduation". Basically, now all that the student needs to do to get to the next belt level is to attend 15 classes. Then he/she is automatically eligible for "belt graduation" which now takes place every month. According to a new head coach for our studio, many students were quitting because they were not able to pass a test, and it was "bad for their self-esteem". More likely, it was bad for the cash flow of the franchise, so they decided to go to a method where at least getting within the sights of black belt is pretty much guaranteed if the student spends enough money and enough time in the studio. Honestly, both my husband and I find this approach problematic. For once, this devalues the whole notion of belt levels in martial arts if a student who cannot even do a basic board break can get almost all the way to the top (they still keep testing for black belts). Second, it takes away both the reward of proving yourself every two month and a consequence of failing to do so. We feel that a lot of decisions made in the name of self-esteem are really designed to clear all the obstacles from our children's experiences. How are they to learn resilience, persistence, discipline and sacrifice, if they are not allowed to fail? Smarty was also disappointed with this change. She did not enjoy long classes (a combined action class and performance class) in an overcrowded studio, but she still really liked her favorite teacher and did not want to look for other options. Also, we already paid upfront until November, so looking for a different studio now would be an expensive proposition. So we decided to play their game. Since every day of attendance counts as a separate class towards 15 required classes, we decided to split her action and performance classes into two different days and have Smarty receive a belt in one month. 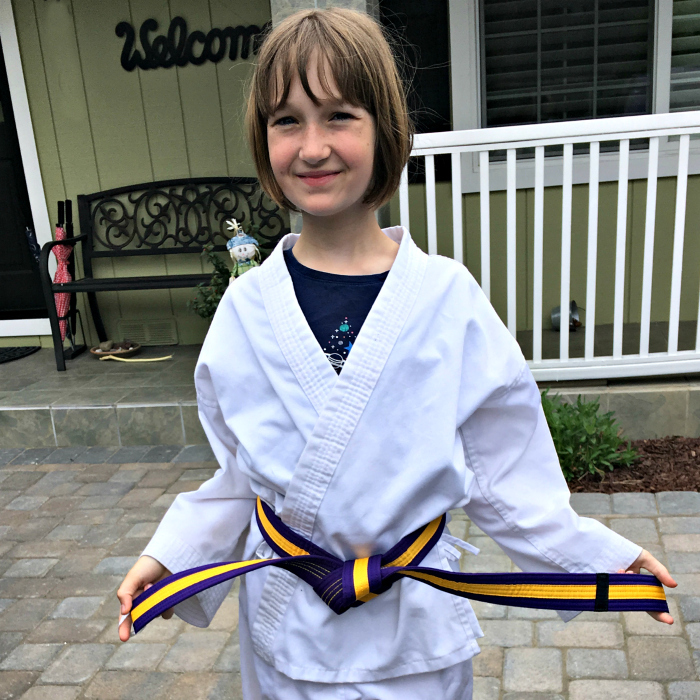 She needs only two more belt levels before she is a brown belt and can join a more rigorous (and smaller) class to start her black belt preparation. We also took advantage of flexibility in our schedules and started taking Smarty to an earlier class that starts at 4:30. It's less crowded, and instructors actually have time to coach kids rather than to deal with behavior challenges from a few kids who consistently manage to disrupt a later class. When we are closer to renewal time, we will re-evaluate and decide whether to stay another year with this studio, so Smarty can train with the same people that she already knows, or to look for other options. Do you feel that, as a society, we are trying too hard to protect our kids from failure? It's more about making money than anything else. We quit because we didn't want to pay the hefty fees for the black belt but she earned her way all the way through so in her heart, she already earned it. I think waiting until the kids are older helps as they tend to take it more seriously with older students. That's terrible they changed the policies. Some sports are ultra-competitive where parents shout at the kids during the games. There needs to be a balance. In a similar vein, our church had a shake-up because our youth pastor left and several parents approached asking if we could up the behavior expectations because they had declined recently (in part due to reasons the pastor left), and the response was "if we increase the standard people might leave." This answer is off-putting to me because we should hold our children to a higher standard, not lower it to where they are. I've seen over and over again kids will rise to what we expect of them.